Some people refer to it as the cold heart of Canada, where its citizens are too busy to hold doors open or smile as you pass them by. But Toronto has been my home for over a decade, a city whose streets are scattered with suited businessmen and hipsters, artists and musicians, teachers and construction workers. I've studied on the 13th floor of Robarts Library, overlooking the U of T grounds, gazing off into the city beyond- subsequently losing my desire to study. I've strolled through the Annex, admiring rings at the Tibetan stall next to the ice cream place, spending hours in Seekers Books, watching people demolish chocolate cake at Futures Bakery. I've sat in taxi cabs with drivers from Afghanistan, Pakistan and India, speaking about their families back home, and why they came to Canada. I've sipped Kashmiri tea while dodging pigeons and pools of red spit on Gerrard Street (Little India) . I've walked through Kensington Market, breathing in the scent of fresh fruit and cigarette smoke...and I've only given you a tiny glimpse of this complex, beautiful city. Although I'm not a political junkie, I care about this country. I care about this city. 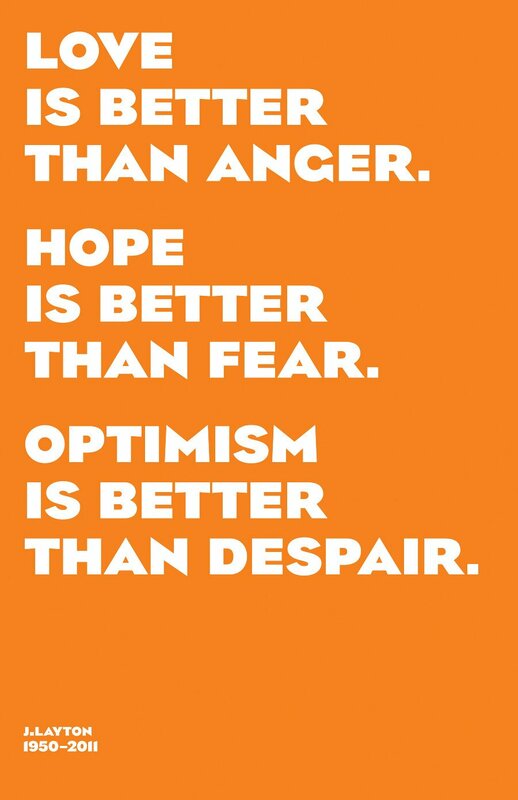 When Jack Layton died, it was not only a moment of shock, but a sense of loss--that we will never find another charismatic, genuine leader to remind us of what matters most. Some media have suggested that mourners are glorifying Layton, but I believe that we're humanizing him. Unlike many politicians, Layton was relatable and real. Someone who made us care. Of course, no one is perfect, but striving for perfection is a noble pursuit in itself. A few days after Layton's passing, I had a meeting downtown with the Director of the International Poetry of Resistance Festival, where we spoke of activism and art. One coffee later, I walked to the nearest subway station and put my coins in the token machine. But it was broken. I had lost the only change I had, and stood there for about half a second when a young man in a fedora walked by and asked me what happened. I told him, and he handed me a token without a second thought. When I put the token in to get through the carousel, it didn't work. As I laughed at the irony and tried to figure out what to do next, a TTC employee came through and I explained what happened. He directed me to the help button and waited for the response after I pressed it. Nothing happened. A few seconds went by, and the TTC worker pulled out his wallet and swiped his pass through the machine, signalling for me to go through. I thanked him profusely and was on my way. A few subway stops later and I found myself in front of a cafe, picking up a sandwich and coffee (yes, another one). The girl behind the counter struck up a conversation with me, introducing herself and asking me which bus I had to catch, and at what time. She wished me well and I sat down to finish my sandwich. Once I had finished, I returned the plate to the counter, and she smiled and said, "Why not have a treat on me-- choose a tart-- chocolate, pecan, lemon...whatever you like." I accepted her offer and hugged her. After reaching Union Station, I made my way up the stairs to the bus terminal, and saw an elderly lady lugging her cart down the stairs. A man stopped her and asked if she needed help. In the bus, the seat I had chosen was wet with sticky soda, and the young woman behind it offered me the spot next to her. I couldn't help but smile. I had witnessed kindness in the past, but not so many kind acts in one day. What was going on? Whatever it was, it was good. It wasn't until Stephen Lewis and Reverend Hawkes spoke of this change in their eulogies to Jack Layton that I realized what may have been happening. Lewis crystallized the sense of hope many of us felt on the night of the election, as well as the days after Jack's passing, "I believe we're slowly being steadied by a new resolve and I see that resolve in words written in chalk and in a fresh determination on people's faces. A resolve to honour Jack by bringing the politics of respect for all, respect for the Earth and respect for principle and generosity back to life." Hawkes echoed Lewis' sentiments, "Over the past few days something has been happening. Young people have said in Canada that they don’t want this feel-good moment to be a fleeting moment." Instead of pitting ourselves against each other, it's up to us to have a lasting, respectful dialogue, despite our different beliefs, cultures and viewpoints. Isn't this what Canada is about? Multiculturalism and diversity are often thrown around, but what we do with our differences is what will determine the future of Canada. We need to cross party lines and resist mindless displays of power and start thinking about our contribution to humanity at large- something many of us think of when we're much older and closer to death. 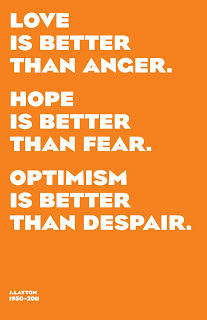 But death doesn't wait for anyone, as we so devastatingly witnessed with the passing of Jack Layton. As he worded it, "Dream a dream longer than a lifetime." In an age of instant gratification, we believe we can fix things instantly- which isn't the case. If we continue to cultivate pettiness and hate, we'll kill the hopes of generations to come. As Reverend Hawkes put it, "Maybe Jack's life can make us better Canadians." But Jack's life is already making us better Canadians- more reflective, kind, considerate and thoughtful. Jack was not a glorified hero or a symbol to be worshipped. He was an example of what we can all strive to become- human. Someone who acknowledges their faults and strives to make things better. Someone who believes in collective responsibility, not "yours" and "mine". Toronto, the city that is often accused of its cold-heartedness, showed its capacity to love over the last two weeks. It reminded us of what truly matters, and of what we are capable of when we keep love, hope and optimism in sight.